By eating leftovers, you can easily cut down on food waste and save some cash. Here's how to do it safely. Though 77 percent of Americans surveyed said they feel guilty about it, food waste is a huge problem here in the United States. A 2016 Guardian report revealed that we throw half of our produce in the trash, which amounts to a staggering $160 billion dollars worth of produce a year. Why do we think it’s OK to waste so much food? One reason may be that it’s less expensive here than in other countries. Maybe that has something to do with why Americans don’t mind spending money on restaurant or take-out meals. According to a report on food prices and spending from the USDA, Americans spent 36.3 cents of every dollar on services provided by food service establishments, 15.2 cents to food processors, and 12.4 cents to food retailers, which amounts to an average of $3,008 per year spent on dining out, says the Bureau of Labor Statistics. All this said, there’s a way Americans can easily cut down on waste and save some cash — they can literally and figuratively start warming up to leftovers. Leftovers are a great way to save money if you remember to eat them, or even remember to put them away. Amy Shapiro, MS, RD, and CDN and owner of Real Nutrition NYC, says one of the biggest mistake she sees people make with their leftovers is leaving them out for too long. “Leave leftovers out for no more than two hours at room temperature. Otherwise, bacteria grows, which is one of the biggest causes of foodborne Illness,” she warns. 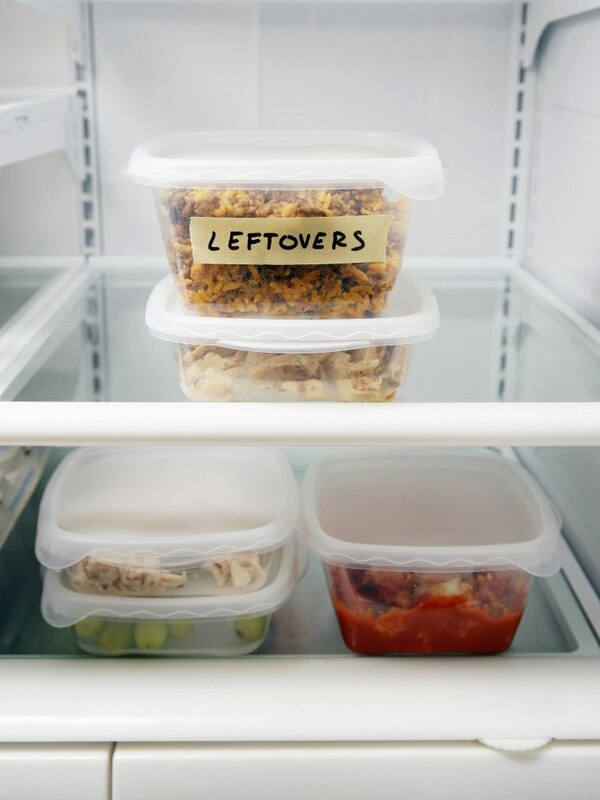 Other common ways to sabotage your leftover game are not labeling and dating them before putting them in the fridge (so you forget how long you’ve had them), not having a purpose for them (or a set time in mind to reheat them) so they sit in the refrigerator and spoil, and not regularly cleaning out your refrigerator, says Angela L. Murad, RDN, LD, wellness dietitian at the Mayo Clinic Healthy Living Program. Store leftovers in airtight containers and add a piece of masking tape to the lid to mark the date — this way you can be sure they’re eaten or tossed out within the proper time frame. Open canned foods should be repackaged, as well. Shallow pans are the best way to cool warm food fast, before storing them to refrigerate, says Shapiro. Your refrigerator temperature should be set below 40 degrees, ideally at 36-38 degrees. “One out of four refrigerators are kept too warm,” says Murad. Avoid overfilling your refrigerator, because it prevents cool air from circulating around food and maintaining its proper temperature. Reheat leftovers on the stove, in the oven or in the microwave until the food is nice and hot, with an internal temperature of at least 75 degrees. Avoid reheating food in slow cookers — it heats food too slowly and harmful bacteria can grow. You can’t always tell (or smell) when food is contaminated with bacteria — it doesn’t necessarily look spoiled to the naked eye. If, even for a second, you suspect your leftovers may have been sitting out or even in the fridge too long, better to toss them in the trash than take the chance and get sick. If you have any questions or doubts about food and beverage storage times, Murad says The FoodKeeper app, developed by the USDA’s food safety and inspection, is helpful to have on hand for reference.